We present you the best JAMB CBT practice software that let you scale through the 2019 UTME like a genius. Our Computer-based testing (CBT) software is like that of JAMB with better user interface. Loaded with 24 SUBJECTS and you don’t even need internet to access them (it works offline). You are guaranteed of Getting Higher Score with this package. ‘CLICK HERE TO DOWNLOAD YOUR COPY NOW‘ | Click Here to Buy the Activation Key Now! FOR ANDROID USERS : CLICK HERE TO DOWNLOAD ANDROID VERSION. Love them or hate them, it’s very hard to get away from exams. Are you about to take the 2019 Joint Admissions and Matriculation Board (JAMB) Unified Tertiary Matriculation Examination (UTME? Do you sometimes feel that “you’re no good at computers“? Does it all feel a bit too much? Would you like a helping hand to organise yourself and keep your motivation levels high? You can take responsibility for your own learning, motivate yourself, set yourself goals and start working in a productive way so that when you take your exam you will feel confident. Believing in yourself is half the battle, so let your self-esteem and your knowledge bloom… We have created a CBT PRACTICE SOFTWARE to help. But it’s not just an ordinary CBT SOFTWARE, it’s an ideal product to help prospective JAMB/UTME candidates prepare for e-Exams/CBT to Get Higher Score. The Electronic System Testing & Preparatory Software was developed to help candidates prepare for JAMB CBT examination, and evaluate their readiness to take the exam. However, the software is a licensed application and is licensed on a per computer basis. The CBT SOFTWARE automatically generates a simulated and randomized JAMB CBT test questions based on past JAMB/UTME questions. The CBT SOFTWARE automatically time the user, mark and score the simulated examination. It also grades the user and displays a performance report. Answers to the test questions, explanations to the answers and other features have been included for a complete learning experience. Why Use Our JAMB CBT Software? Contains 16,000+ Questions Offline – practice authentic UTME past and model questions from 24 subjects with detailed explanations. Summary of 16 JAMB prescribed literature textbooks – study literature textbooks including. SWEET SIXTEEN and practice over 1000 likely questions. Does Not Expire – continues to function as long as your device stays alive! Dictionary – get definition of over 92,000 words offline. Educational Games – have fun while learning with our fascinating games. School Finder – using School Finder is by far the easiest way to know JAMB requirement for any course in Nigeria. Offline Chatbot – chat with Clara to find answers to most requests using our custom built Chatbot technology with amazing artificial intelligence. 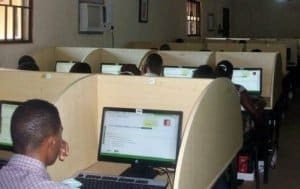 Is the JAMB UTME CBT Practice Software Really Free? Yea, the software is free to download via the link provided at the end of the post. However, it has been stated earlier that it’s a licensed application, so you have to pay to get its license and enjoy its full functionality. As a matter of fact, you can use the demo of the product before paying for it. If you need the JAMB CBT Practice software license, you have to pay the NGN1,500 activation code/license fee. DISCLAIMER: The questions contained in this software are not in any way inferred as the original questions you will write in your 2019 JAMB UTME. We do not provide students with any material that promotes examination malpractice. The contents on this website are purely educational and suited for students preparing for the said exams. I’m Joel, a cybercafe owner in Lagos. I use this practice software on over 50 computers in my facility. So far, it has been excellent! MySchoolGist CBT Practice Software is versatile, I think I have finally found a CBT practice companion that can teach me things on the level I am looking for! I find it so incredible. We have received series of awesome testimonies from many users of our product. You can also be the next happy user. You won’t regret getting one. Please,what do i need to do to have the software installed on about 15 systems in my school? You can download the set-up from the link above and then get it installed on the 15 computers. However, you will have to get the activation code for each of the system. Haaaaa,o boy it is not easy oooooooo u need to work hard.thank God it up to 5c. @Bobo, you have to pay for the activation code. Just N900. can i register for jamb on the software? @Femi, it would be difficult to track your payment, try to pay to the Bank and forward your details. @tomisin, pls kindly use the contact page and send your details to the admin directly or to the number provided on the contact page. If a science student wish 2 study psychology what shld be his/her combination? @Bioko, you do not need network before you activate the software. I got only activation code. but what of the username? @Musty4, you can use your desired username, i.e, any name of your choice. plz im paying with my Gt bank master card transfer, so how do i get to which will not have a teller no. so how do i notify you of my payment? When you’ve paid in the bank, how long does it take to receive the activation code. @Timi, You should receive the activation code 2hrs after sending your details to the number above. @Victor, Kindly use the contact page to, talk to the admin directly. Pls, How Do I Pay For Four Different Ones To Be Used On Four Different Computers? This Is Because I’ve Downloaded Four And I Want To Know If I Will Just Pay N3800 Directly Or I Will Pay N950 Four Times… After Sending The Text Message Containing All The Needed Information, How Fast Will I Receive The Activation Code? This Is Because I Want To Do This For My School So I Have To Tell Them The Time Frame At Which The Thing Will Be Completed. @Tolu, you have to pay N950 for each activation code which will equate to N3,800. You should get your activation code max. of 2hrs after payment. Please l need a help. Whenever l connect to the internet and start the program, l get a bad message – …cannot connect to the database. But when l disconnect the internet, the program runs fine. Why? @Justice, kindly uninstall and install the software again. @Happy, You can only see your ID after you have installed that software. Kindly check using the above steps carefully as your guide. 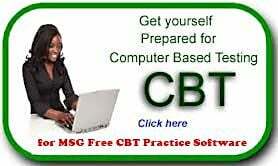 I HAVE JUST BOUGHT YOUR CBT SOFTWARE, IT IS NOW WORKING,THANKS FOR BEING OF THE HONEST NIGERIA ON ONLINE BUSINESS. IT IS GOOD TO BE GOOD BECAUSE GOOD MARKET ADVERTISE OTHER BY ITSELF. I learnt that Library Science (LS) is good to go for Poly Nekede with such result, but Please what of University. @Every Nigerian university that offers those courses I gave you earlier. Library science in unilorin requires mathematics but those other courses doesn’t. @Dfanumudu, you can study Mass communication, political science, international relations, library science,etc. Adekunle, You will choose you don’t have a simple pay account and you can proceed from there. Try and read the last paragraph above too. sir, is ijmb a legal educational organisation with study centers in all NIgeria state HQ?. What is their official webside, shaould trust them like utme? @stephen, IJMB is a legal and accredited educational organization with their official website @ http://www.ijmb.org.ng. The point there is that not all universities in Nigeria require/demands these results from students. The software is good and should be recommended for jambites.. i ll buy 1 license to try the “full functionality” before recommending it for my students… I was calling your line but you not responding.. How soon will i get the license after the payment??? Thumbs up for your good works. @MR. Edafe, You will need to complete the last step above via sms and we would send you the license key within 4hrs. Can i use one activation key on more than one computer? @Cletus, No. Each application has different Product ID on every installation. @inioluwa, Jamb form will close early 2015 and click here for Jamb Examination Date. am going for mechaninal engineering,what chances do i hav with dis result@eng c5,maths c6,physic c6,chemistry c6. @Evans, You have a good standing.